Good evening. I'm cheating a bit today, posting pics of other people's craft projects. The ladies brought them to this mornings craft club to show, and I thought they were so clever that they deserve a place on my blog. We have got some talented ladies in our group. This is a picture embroidered onto canvas. It is stretched over a wooden frame, all it needs is an attractive frame to complement the scene and it is ready to be hung. This is not a kit, the lady designed the whole thing from choosing a nice scene, to picking out the colours and stitches she wanted to use. The stitching is really intricate, I love it. The back has extra fabric machine stitched around the edges so that the threads can be pulled tight across the back to keep it square. Another lady brought in two books that she has made. The picture on the front is embroidered in tiny stitches. The front and back cover is two separate pieces. The fabric is pulled tight and secured at the back, then covered in decorative parchment. The pages are thin card so it could be used as an album. Here is another one, with a cat on the front. Lots and lots of small French knots make up the picture. Very clever how the pages are joined together. This afternoon the weather was glorious. I took my radio outside and listened to Steve Wright in the Afternoon while I planted up my beans, peas, and courgettes. My ears pricked up when I heard the name Jack Munro (linky to her web site) mentioned, she came on the show to talk about her book. She's doing very well for herself promoting cheap meals. My meals will be even cheaper when I start harvesting my home grown vegetables. Dinner tonight was very cheap, all reduced of course. Half a punnet of mushrooms 11p, two chopped spring onions, a handful of chopped spinach, cooked in a little oil, a teaspoon of wholegrain mustard, a shake of garlic powder, and a dessertspoon of plain yogurt added at the last minute. Served on a large microwaved potato. Must have cost all of 25p at a guess, and it was chuffin lovely. Beats all your fancy mucked about food they serve up in restaurants. The smiley Sue G has sent me a photo, she is carrying an original 'Ilona' bag, on her way back from holiday up north in Scotland. Below is the email she sent. Just thought you'd like an update on your (now my) bag. 'Bag' has been on holiday, to the Inner Hebrides, to Islay and Jura in fact. (Should have taken it to Iona really, since it has Ilona embroidered on it!) Anyway, it came in very handy for putting all sorts of things in, and it enjoyed it's two weeks away very much. It would be interesting to know how well-travelled your other bags have been. 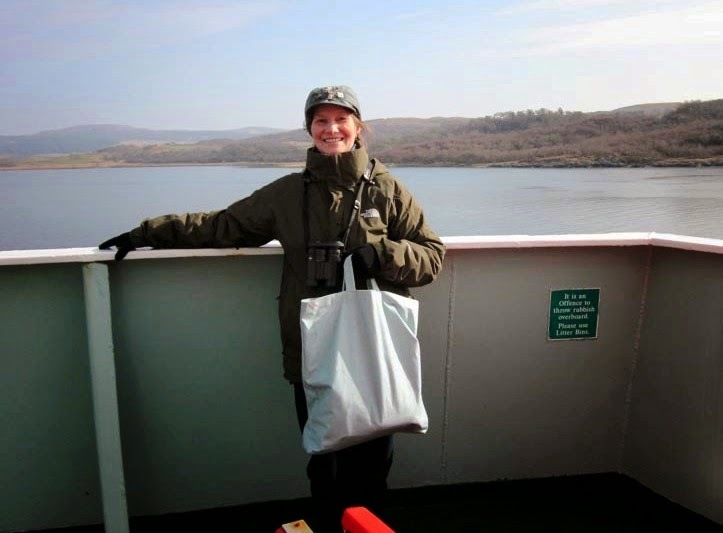 Thought you'd be pleased to know what a wonderful time Bag had, camping and birdwatching and seeing lots of winter geese. Thank you Ilona! Thank you for the pic, Sue, I'm pleased that you like the bag and you are finding it useful. Your suggestion of finding out what has happened to the other bags I sent out is a great idea. Let's ask everyone who won a bag to send in a photo of themselves using it, with a description of where they are in the world, and what they use the bag for. That would be great fun, I will post them on a separate page so they don't get lost in the main body of the blog. So how about it folks, email your photo's to the address on the sidebar. I hope you don't mind but I went out for the day yesterday, a spur of the moment thing, like you do. I fancied a trip to the Midlands to visit family. My goodness that M1 motorway is a pain, twenty miles of roadworks at 50 mph. Why they can't do it in four separate lots of five miles I don't know. Good for the fuel consumption I suppose. Uncle and Aunt are doing fine, they have just had their veg patch flattened and graveled over, a lot less work for them. The strawberries have a new bed, and there will be some runner beans planted soon, they are aiming for low maintenance gardening. Sisters new bungalow is looking fabulous now the new conservatory is up. It was gutted when they moved there and they had to live on site in their caravan for a while until the work was done. The house itself is smaller than their previous one, and although the garden is smaller, there is room to park the caravan at the back. They are well chuffed as it's in the area they like, and near to children and grandchildren. On the way back I hit Tesco at just after 8.30pm, it's at the end of the motorway just off the roundabout, well I had to pop in didn't I, ha ha. A few yellow stickers left. I was looking for bread, but there was none, oh well, never mind, I will manage without. I have four slices left in the freezer and some potato cakes, I'll eat them instead. I spent more on the cats than I did on me. Chicken pieces £2, yellow stickers £1.18p. I have added it to the list on the page above. It was a quick dash round, wanted to get home. I have a confession, I didn't do the 5k Park Run yesterday, I know, I've let myself down. I just didn't get organised in time, wanted to get off down the motorway. Never mind, I promise to make up for it. Extra on the cross trainer, and more walking around the village, I might even get the bicycle out for a ride. Looks like a sunny day today, the first day of summer, YIPEEEEEEEE. I think it might be time to take the winter curtains down now. Got stuff to do in the garden, a line of washing to get out. Let's make the most of it. Enjoy your Sunday. Good morning, it's raining so I will get on with this post and maybe go out later if it stops. Someone asked for more information about finding reductions when food shopping, or as it's widely known, yellow sticker shopping. Not all reductions have yellow stickers on, different stores have their own way of doing things. Some go through their shelves of short dated stock and stick a blank label on and hand write the new price. Tesco have big yellow stickers, Sainsbury's have small yellow stickers, Spar shops use a large hand written sticker. Where in the store do you look for reductions? For a start you need to get to know the layout of the store. Fruit and vegetables are often near the entrance, or close to the back door to the store room. These shelves need replenishing regularly so easy access for large trolleys is important. If there is an instore bakery the bread and cakes will be in the middle towards the back, so they can wheel out the freshly made loaves as they come out of the oven. The meat needs to be put out on the shelves pretty quickly as it is packaged up, so an aisle with access from the butchery department in the back is usually chosen. Some stores will set aside a section in a chiller cabinet to gather all the reductions together in one place. Others will leave their yellow stickers with the rest of the same stock, so customers can take the cheaper item first. Some people will bypass the cheaper one and reach to the back of the pile to get a longer date. I think that's a bit daft. I have pointed out to people that the one at the front is cheaper, they answer, I don't want to use it straight away. We all know that the dates are a guide, but some folks are funny and will chuck out food on the actual last date. When I walk in a shop/store, my eyes are programmed to search out bigger stickers than normal, be it yellow, plain with a red edge, hand written, or small yellow. I ignore everything else. I skim along the shelf edge looking for any labels which say REDUCED. Anything that catches my eye, or jumps out at me is worthy of a second glance. I go around the store like this when I first go in. When I have satisfied myself that I have found all the bargains, and picked out what I want, I then go around again, picking up a few must have items which I know are never going to be reduced. So, priority is, what is cheap, buy reduced first and base my meals around the bargains I can find. Some of the discount stores, Poundstretcher, Home Bargains, B & M, Pound shops, have a trolley near the checkouts with half price of reduced dated stock. Have a look there first before you go round the rest of the store. There won't be any fresh produce there, but sometimes you will find tins and packets about to go out of date. Beware though, there is a lot of junk, cake, biscuits, fizzy drinks, sweets, which you don't really want if you are trying to follow a healthy diet. You have to be disciplined not to pick it up, even though it is cheap. I usually walk away from it, but I am not perfect and sometimes get a little treat for myself. When picking up yellow stickers in a supermarket. put them in your trolley with the sticker face down. It has been known that other savvy shoppers will take things out of your trolley when you are not looking. If there is a bit of a scramble around the lady with the ticket machine, chat to her, be friendly, and make it like a game. No point in being nasty. Tempers can be lost and yellow sticker shopping becomes a misery. Make it fun, so what if you didn't get that small cauliflower with wilty leaves, go for the sprouts or the broccoli instead. If there are several of the same item available, don't grab the lot, say, I'd like two of those, and point out something else that the other person might like instead. I have had people hand me something from their own trolley, when I said, ooh dear I missed those. Of course, the level of niceness might vary depending on where the store is located. My Tesco is on the edge of the town, to shop at night you need a car to get to it, so not a lot of competition. If it is a store close to town or a housing estate, there will be more people looking for bargains, so there will be some grabbing going on. Not very pleasant, but there's ways of getting to the front without the pushing. I have been known to get down on my knees to get to the bottom of the chiller cabinet. So, when is the best time to look? Anytime between 2pm up to 9pm. The meat usually comes out first, because it's got to be shifted quickly. The supermarkets start with a small markdown first, then later a second and a third markdown. The later it is the cheaper you will find it. Saying that, you may be unlucky and find nothing left if you go in at 7.30pm, because some people are satisfied with a 50% reduction. I like to take a gamble and go later to get 90% off. Of course I may be unlucky and find there is nothing left. It all depends on how much the management have over ordered the stock by, and how much people are prepared to pay for it. Supply and demand. Do not waste time and petrol going from shop to shop, that is daft. Always combine journeys, if you are going out somewhere time it that you are passing a supermarket on your way back. It could be worth stopping for ten minutes to check out if there is anything to be had. Don't be embarrassed about foraging in shops, the markdowns are there for everyone to buy. You are being savvy to search them out. Some people will say, oooh, I couldn't do that, and look down on those who do. Well bully for them if they can pay full price, let them. I have to make ends meet on my pension. I don't load my trolley with expensive crap. I look in their trolleys and think Jeez, what awful food you eat, then watch them hand over the plastic for a £100 bill. They are subsidizing my food bill, it makes me smile. Are you going to become a savvy shopper? You don't need to go to the extremes I do. It would be more difficult to shop like this if you had some picky family members, it's easy if you only have yourself to please. Also, work can get in the way, and your time may be limited, but can you call in a supermarket on the way home. Worth a look if you are passing. I picked up a few items yesterday on the way back from my walk. Another £2.94 spent, listed on the page above. I woke up to sunshine this morning, it should be a nice day for a walk, I thought. So I quickly got myself ready, packed my small rucksack, picked up the ,map I printed off last night, just in case, and set off towards the Humber Bridge. I didn't go over the bridge this time, but headed east and carried on to Barton, then to Barrow, and parked next to the church at Goxhill. This is All Saints Church. I saw that there were some workmen busy inside, so me being nosey I asked what they were doing. Apparently the roof has been stripped of it's lead by robbers, and they were there to make repairs because the rain is coming in. They are using a different material, so it shouldn't get stolen again. This seems to be happening a lot. I reckon that the parishioners should start removing their own lead before the thieves get it, then sell it and use the money to repair the roof. With the price of metals being quite high, they would make a few bob on the side to go in the church collection box. I didn't expect to see Cliff Richard in church today, ha ha. Heading out of the village I came across this red telephone box, only it's not a phone box any longer. It's a mini library. Help yourself to any books you need, and bring your unwanted books to fill the shelves. What a good idea. It could do with a clean though, the windows were a bit mucky, and the floor needed sweeping. A bit of polish would spruce it up a bit. I left the village via North End and walked down a very long straight road towards the River Humber. This brought back memories. I used to drive my cement tanker down this road, to make a delivery to the tile works. I wondered if it was still operating. I got my answer when a lorry load of roof tiles came towards me. It was very overcast, I could only just see across the river to the docks at Hull. It started raining, then the wind got up, and the rain came harder. In the distance you can just about make out the ferry boat at Hull docks. I walked along the waters edge for about an hour, hanging onto my umbrella. There was nowhere to sit down for lunch, so I had it standing up propped up against a concrete wall at East Halton Skitter. The Skitter is a bridge that goes over East Halton Beck where it joins the river. My makeup free selfie. Time for a sit down in the park at East Halton. It has stopped raining, finished my sandwich and the second boiled egg. There's a shop round the corner, I fancy a lovely Magnum Infinity ice cream. Yum, chocolate and soft caramel. Haven't had one for months, must treat myself. The pub at West Halton. I left the village across the fields, went through a wood, past a pond, across a little bridge over the Beck, and joined the road through South End, back into Goxhill. I was back at the car by 4pm. That was enough, the rain had started again. Just a short walk today, a little over 11 miles. There isn't a lot to see in this corner of North Lincolnshire. It's very flat, all farmland with massive fields, no animals all crops. Goxhill is a large village with a lot of big posh houses with huge gardens. It's a bit too far out on a limb for me, nice if you want a quiet life and don't want to wander too far afield. I would rather have easy access to a motorway so I can get out and about. That's it for tonight. Catch you tomorrow. Toodle pip. PS. Picked up some yellow stickers on the way home. Added them to the Reduced page. Link at the top. Every morning when I wake up I hoist my body into an upright position, and prop myself up with pillows. I then close my eyes and ponder. What shall I do today? Is there anything I have to do? Be somewhere at a specific time? Or have I got a free day to do what I please? Organizing my day is important. I get the most pleasure out of it when I am productive, when I am useful, and when I can make a contribution to to the wider society that I live in. Looking after my mind is as important as looking after my body. So in the morning I lay in my bed, planning what I am going to do. My friend is going on a ramble today, it is too far for him to take his dog, so I will go into his house at midday and get Lady out for a walk. I will sit in his conservatory for a while, reading a magazine which he leaves out for me to do the crossword, while the dog bimbles around the garden. Today I am expecting a packet in the post. My nephew has sent me some seeds and I need to get on with sowing them in pots. I hope it doesn't rain because I want to tidy up the bushes and hedges in the back garden while I have the electric trimmer. Then the job will be done and I can give it back to Barry. Next job is to make up some of the veg I bought yesterday into stews and curries, and freeze portions in margarine tubs. I wont be able to eat it all in the next couple of days so freezing it will give me some cheap meals over the next few weeks. I have a few crafting projects on the go, but these are not priority at the moment. I will be picking these up at odd times in between other jobs. Now the weather is getting better, I shall be outside a lot more. Litter picking needs to be done once a week, and I want to do one full day walk every week, so map reading and planning is priority now. Blogging is always priority, so I spend a few minutes pondering about what to write about next. Sometimes an idea comes out of the blue, other times I still haven't come up with anything at nine o clock at night. That's when you get the drivel, ha ha. So, planning makes for a better post, hopefully. The idea for today's post has come from reader Gam Kau. She sent me a link to another blog, which I have checked out. This led me to another blog, and another, like you do. So my idea for today is to send you off to have a look at other useful and interesting blogs. It's good to share knowledge, life is a learning curve. Enjoy your reading, but be sure to come back to this one tomorrow. Thank you Gam Kau for getting me started on this. Lois is a mother and grandmother who is into living in a small space, and making something old into something new and useful. Look at her Blogroll for lots more linky's. Daniela is into frugal, obviously. she does DIY, painting, thrifty, and has an Etsy shop. There are adverts on this blog which I am not keen on, but the content is good if you can ignore the adds. Buy Nothing is a project started by two friends. As it says, there are ideas for making things from what you already have. Anyone can start a local group, it's all about people getting together and sharing their knowledge. Random acts of kindness are encouraged. Kathy writes about exploration of ideas, stories and information, that can lead to a more happier, simple, peaceful and compassionate world for everyone. No topic is off limits. A thought provoking blog. Katherine is a very crafty lady. It's not all about pillows as the title suggests, but lots of fun and quirky ideas for small crafty projects. There are a lot of upcycling ideas as well. There's five to be going on with, that will keep you busy for a while. Toodle pip, I must get started on my plan for today. Yellow sticker Queen strikes again. No no, don't all get excited, this is not my work. This beautiful cushion was lovingly stitched by one of our Monday Craft and Chat ladies. She finished the picture then decided to make it into a cushion. Hours and hours of work have gone into it, I don't think I would have the patience. Today I have been very busy. This morning there was no internet signal here, don't know what happened, so I got on with other jobs. I borrowed an electric hedge trimmer and tidied up all the bushes in the front garden. They were beginning to bug me, don't like straggly sticking out bits, and I like to keep my bushes within the boundary of my garden. If they start spreading over next doors garden and onto the footpath at the front, I chop them back. I fancied some pasta salad for lunch. It is quite expensive to buy ready made, so I thought I could make my own version a lot cheaper. Pasta twirls, with spring onions, celery, and pickled onions, chopped up into small pieces. Three spoons of tartar sauce. There is a big bowl of it in the fridge, I shall be digging into it over the next few days. It's very nice, I like cold pasta. More gardening this afternoon. I went to help Helen. We have decided not to chop back the cherry tree, because I can't reach the top branches. I've done all the lower branches and tidied it up a bit, but to reach higher will need extra equipment. I've tried the extending loppers but they still don't reach high enough. Looking around at other gardens, there are trees a good bit taller, so we think ours is alright. I took a load of branches and clippings to the tip, then called in at the small Tesco on the way home. Look what I found. More yellow stickers. This little lot will last me nearly a week. The Maris Piper potatoes were 95p, reduced from £2.63. I haven't had any potatoes for a while because I have been buying other vegetables cheaply. There are some big ones in the bag which will be great for microwaving. Two bags of spinach, 21p each. Five packs of vegetable selection, carrots, french beans, baby sweetcorn, and brocolli, 20p each, normal price £2. Grapes 56p. I'm well chuffed with this. I think I will start my yellow sticker page now. It would be a shame not to include these. £16.88 worth for £2.93. I'll get on and do it now. Someone asked for tips about yellow sticker shopping, I have written about it before, but I'll write another post soon. Toodle pip. Hello. If anyone wants to ask me anything I will try and answer, I'm not saying I know everything, I don't, but if I can draw on my life experiences and share some of the knowledge, I will try and help. Gam Kau posed a question yesterday. I love your frugal ways and your lifestyle. Healthy, wealthy (in the way that counts!) and wise. We can all learn from you. I was wondering, did you ever go through a point in your life where you weren't so frugal? It seemed to take me until middle age to pull myself together and be properly frugal. Years ago, if you had mentioned the word frugal, I wouldn't have known what it meant. I suppose I was frugal though, but didn't know it at the time. I was taught to save up for the things I wanted, and plan my spending carefully. My mum was my teacher, she managed to keep the family clothed and fed with a roof over our heads, on very little money. We never had pocket money, there wasn't any spare to give us. We had treats now and again, like a shilling to go and buy sweeties at the corner shop. Sometimes only sixpence, we could afford four blackjacks or fruit salads for one penny, or a big gob stopper. We learnt from an early age to chose the best we could for the money we had. We saved our birthday and Christmas money to buy something bigger. When I left school I got a job in a shop. I wanted to buy a trouser suit from a rather posh ladies clothes shop, but didn't have enough. Mum allowed me to put a deposit down and pay weekly out of my wages, she signed as guarantor. I had a little payment book, and every Friday, I went in the shop and paid the installment, before I bought anything else. Then I went home and paid my mum her board and lodgings money. I contributed to the household income as soon as I had my first wage packet. I left home at 18 and got a bedsit in Blackpool, now there was no mum to fall back on if I ran out of money, it was down to me to budget properly. I had a job, my rent took up a large chunk of my wages, then I had to be careful with what was left, to buy food, a bit of money for going out, and the electricity meter. I remember walking almost everywhere then. A few years later I went back to live at home for a while, then I got a rented flat, preferring my own space. All the jobs I did at that time weren't particularly well paid, I worked in shops, offices, and factories. When I got to 27 I found lorry driving, and my wages then increased enough to be able to buy a house. I was paid the same as the men from the start. It wasn't fantastic, I was never going to get rich from driving, but I reckoned that doing something I loved was a far better prospect than being stuck in a job I hated. The money almost didn't matter to me, as long as I had enough. And to make sure I did have enough meant not spending more than I earned. I was skint when I got my first house, lived in chaos for a while until I saved up to pay for renovations. Slowly things began to get a bit easier, then I sold and plunged all my money into a bigger house. Then I was skint again, but able to keep up with paying for everything. The only time I borrowed was from an ex boyfriend who lent me £3,000 to replace windows and a door which were falling apart. He didn't want any interest, and I drip fed the payments back into his bank account. All was paid back in a year. Apart from a mortgage, I have never taken out a loan from a bank or a lender, and never bought a car on finance. I just couldn't do it. That would be spending someone else's money and I wasn't entitled to it. What I did do once was to remortgage so that I could afford to change my dilapidated clapped out old van to a half decent second hand car. I needed to be able to get to work. I already owned more than half my house, so I reckoned that the money was mine to use for a car, so I could earn money to keep up the repayments. As I previously mentioned I never missed one mortgage payment. Paying for a roof over my head was priority. I have juggled credit cards in the past, to take advantage of 0% interest, but that was mainly to help the cash flow for my business. Buying stock with plastic, selling it, and paying off the bill when it came through the door. I must admit that long term saving was never on my agenda. I try to keep a small buffer for emergencies, that's all I need. I have no desire to amass great wealth, money was never a motivator in my life. There are far more important things. That's the wealth side of your question answered I think. What about health? I was skinny when I was a teenager, and through most of my twenties, then I put on weight when I became a lorry driver, through unhealthy eating. No time to sit down for a proper meal, always snacking, goodness knows what I put my body through. At least I didn't get a beer and fried breakfast belly like some of the men, I gradually crept up to almost eleven stone. Mind you with the physical hard graft I was doing, an extra few pounds didn't matter. Some of it was muscle and I needed pretty strong biceps and shoulders to assist with all the lifting I was doing. My last driving job was pretty easy going, mostly driving, so I didn't need to be strong any more. I started to look after myself, cut right down on the snacking, always took my own pack ups. The weight dropped down to a more acceptable level, and now I am back to 8 and a half stone. So, I'm not sure if I have answered your question, 'Did I ever go through a point in my life when I wasn't so frugal?' I suppose the answer is no. I can't say I went off the rails, went on a spending spree running up debt, spending money I didn't have. It never happened. I am the only one responsible for how I live my life, it was always up to me to earn enough money to pay for what I need. My mathematics are simple, the money coming in on the one side, has to be more than the money going out on the other side. That's what I was taught, and that's what I have lived by. I haven't been swayed by seeing other people with more than me, and I don't feel one bit envious of those who have far more than I have. I am sorry if that makes me sound smug and self righteous, I don't mean it to be. Hope that has helped. I think as long as you stick to the simple rule of not spending more than you earn, you can't go wrong. Paying interest on a load of debt is chucking money away. I have paid a lot of interest on my mortgage, but that is better than paying a load of rent which I won't see one penny of again. You mention pulling yourself together, Gam Kau. That is up to you. Don't beat yourself up if you don't quite manage to get things right. You fall down and you keep getting back up, and you try again. I made some daft decisions when I was younger, everyone does. As long as you admit to yourself you are on the wrong track you think oh chuffin hell, I shouldn't have done that, and you change direction and get yourself on the right track. Good luck to everyone with finding the right way for you. There will be a few dead ends, but eventually you will get there. Thanks for reading. Toodle pip. Good evening from Tightwad Towers. I hereby claim my title as Queen of Mean. No one can live as cheaply as I can, unless you are living in a tent. Every meal I make has to be below the £1 mark, often it is way below, a few pennies sometimes. Cheap food doesn't mean it is rubbish food. Healthy food is what I look out for when I go shopping. I don't take a list, I go shopping with an open mind. I am not a fussy eater, as long as it isn't meat, and not stodge or junk, I'm ok with whatever I can find that is a good price. I happily buy Value or Basics, and search out yellow stickers in the supermarkets, out of date food at the cash and carry, and any other reductions I can sniff out. More and more shops are reducing stuff when it is near to going out of date. If I see a good buy I will stock up on it. I buy on price, not what I fancy having for dinner. So, what's for dinner tonight. I've started another stew, there were a few dregs from the last one finished yesterday, so I've added it to this one. Reduced celery hearts, reduced swede, reduced spinach, three onions from a big sack, a tin of red kidney beans 21p, a handful of Quorn mince, and the usual curry powder, sauce mix, garlic powder, turmeric, and porridge oats. There's three big size meals in this pan, could easily stretch to four if I had it for lunch as well. I will eat it on three consecutive days. I won't be bored with it because it is delicious, and I won't have to bother with cooking until Wednesday, so saves on gas and time. Just out of curiosity I have been saving these yellow stickers, to add up how much savings I have made. I started collecting at the beginning of January, but these are not all of them. I haven't cut them from the yogurt pots, or other packaging which made it difficult to remove them. These are from mainly fruit and veg, and bread. The total value of these items was £63.72, I paid £11.89, a saving of £51.83. We still have some days to go before the end of March and I may well do another yellow sticker shop, so at a guess, if I saved another £10 that would take it to £60 approx saved in three months, £240 per year. I consider that the effort I make in searching out the best prices is well worth it. Starting on April 1st, I am going to keep a diary of my yellow stickers only. Noting everything I buy which has been marked down because it is going out of date. I'll do it for three months, and it will give me a more accurate figure. I get a feeling my above estimate might be a bit out, and I am saving more than I think. We shall see. I'll add a separate page at the top for it and you can follow my progress. If you don't have yellow stickers, why not challenge yourself to search out the bargains wherever you are. Make it a new rule, don't just pick up the first thing that comes to mind, the same thing you buy every week, look for something which is better value, where you get more for your money. That's all, thank you for visiting, Toodle pip. Can you see what I have been waiting for these past few nights? 10.30pm, nearly there. a few more. Wonder how many it will get to by midnight. Then it will drop back down to start another day. Hands up who did the Park Run this morning. Me me me. Yes I did it. I arrived within 5 seconds of it starting, I even had to sprint across the car park to tag on to the end of the line. No porridge this morning, I reckoned bran flakes wouldn't be as filling. Fine, except that the liquid sloshing about in my stomach was a bit uncomfortable. I think I need to limit myself to half a mug of coffee next week. I left the fleece off this week, instead had a vest, thin teeshirt, and a long sleeved polo shirt on. I was flippin freezing, my poor hands were looking distinctly blue with cold. I should have put my gloves on, but I got out the car in such a rush, I forgot. Oh well, it's all a learning curve, I'll get it right eventually. I was so cold I didn't run all the way round the first circuit, I started adding short bursts of fast walking sooner than last week. I kept checking my watch to see how I was doing, at the halfway stage I was on 18 minutes, slightly faster than before, even with the walking. My walking is pretty fast. I've just checked my time on the web site and I'm pleased to say I completed it in 38 minutes 48 seconds, so a bit better than last week. There was a lot more runners today, and we had to wait a minute to get scanned at the end. 284 in total. The woman next to me said she used me as a pacemaker and I kept her going. She was a similar age to me, I also kept her in my sight all the way, we kept overtaking each other. I asked her how long she has been coming, she said, since it started, a year ago. I asked if she felt she was fitter for it, and she said yes, definitely. So that promising, there's hope for me then. Are there any more who want to add their times here? Let's see if we can encourage each other. On the way out of the village this morning I saw that there was another skip at the house which was being emptied. It has been up for sale, and they did say they would need to clear everything out of the house once it was sold. I didn't have time to stop, so I made a point of driving past on the way back to see if the skip was still there. It was. They had laid some garden stuff out on the front lawn with a notice on for people to take what they wanted. Of course I had to have a look. I was there for an hour picking my way through the contents of the skip. They said I could gladly take anything, it was all going to be dumped. I shifted things around to see what was underneath, they had laid some heavy things on top so I couldn't see to the bottom, but I had a good rummage. The woman kept bringing things out of the house and asking me if I wanted them. I took anything that was offered because we can sell it to raise funds for the cats. A few items I will keep for myself, some I will give to friends, and the rest I will take to charity shops. I wish I had been there yesterday when the skip arrived, and watched as they filled it. It was very sad to see how things had been thrown in, perfectly good household items which had broken. Someone could have made good use of them. The woman was clearly very emotional as she brought things out. She told me about the two plates she had in her hand, how her mother had served cakes up on them at the tea table when she was a little girl. It was like she didn't want to let go of them. I suggested she keep them, but she said they had taken as much as they can, and they can't keep everything. I couldn't let her throw them away so I took them from her and said I would find a good home for them. I was almost in tears with her. Her mother has gone into a care home and is not very well at all. So now my newly de cluttered spare room is once more cluttered. I could open my own charity shop here. This is only a fraction of what there was. Some items are brand new, still boxed, and never been used. I rang my friend B, he came to have a look and took two saucepans, and other bits that he could make use of. I have some nice fabric for my sewing projects, and a fleece throw. I will give everything a wash and make sure it is clean ready for sale or to give away. House clearance is de cluttering on a big scale. It would be better if people would pass on things they don't need when they are still fit and able. There's a lot to be said for sorting out your affairs before you go. Relatives often don't have the time to go through every single item and distribute it to the many different places it could go. Such a shame that people are going out and buying new, when there is so much second hand which could be put to good use. Sad, that someone's life possessions end up in a skip. Not a bimble along the River Hull. It's been brass monkey weather today, although it started out bright and sunny, there was a bitter cold wind blowing across the fields. The shorts didn't come out of the bag, and I kept my jacket on all day, mostly with the hood up to keep my ears warm. My cheeks are rosy, I have wind burn, not sun burn, ha ha. I went over the Humber Bridge to Beverley, around the ring road, and parked on the north side at Hull Bridge near Tickton. My idea was to head towards Driffield, following some of the route I had planned on taking when I came back from South Shields in September. I didn't get as far as Driffield today, so I will have to go back again another time and do a bit more. Hull Bridge is a narrow footbridge, it used to be a road bridge, until they built the bypass which runs alongside it. There's the bypass bridge over there. The Crown and Anchor pub next to the bridge. I set off alongside the River Hull. The water level is very high, flooded in some parts. It's twice as wide as it should be. Past the Nature Reserve, the water splits into two, I took the left channel, the Beverley and Barmston Drain. This goes in a straight line and meets up with the winding river further on. In a field near Aike I spotted these cute fellas. I say fellas, some of them could well be female, I'm not sure how you tell which is which. They saw me approaching the fence for a photo, they were curious about me as much as I was about them. Hello guys, you look very handsome. I love talking to animals, I'm sure they understand me. This one made me laugh, isn't he lovely. I would love one of these in my back garden. This one is pretty. I had a lovely conversation with this horse. He is now my best friend, ha ha. Yes, a 'he'. It was time for lunch, not many places to sit down so I kept going past the water works, and Tophill Low nature reserve, and arrived at Hempholme Lock, where the river joins the drain. On one side there is a weir. I sat on that low wall on the left, to eat my cheese and spinach sandwich and two boiled eggs. On the other side are two lock gates which look as if they haven't been opened in a long time. This view was pretty much what I was seeing all day. A bit further along there were lots of boats moored up. This one looks as if it was wrapped up for the winter. Big 'Keep Off' notices were plastered across the entrance. At this point I crossed over the river, so I could continue up the other side. At Emmotland I took a track which joined a road, then turned right down another track onto the road. Then I stayed on the road past a huge camping and caravan park, next to the Water Sports Centre. Still on the road I turned right for Burshill, and headed back to the river, and then followed it back to my car. The hens look like they are having a good time in their dust bath. I got back to the car at 5.45pm. Have checked the mileage, a bit more than last week, at 16.65. The problem with walking in this area is that there aren't enough footpaths to complete a circular walk, some road walking is necessary. Also there are long stretches of water with very few places to cross, so studying the map and planning the route is important. If you get it wrong you could end up going miles out of your way because you couldn't cross when you wanted to. It's very flat and the wind was very cold today. Some of it wasn't very pleasant, especially when it rained sideways. It was good exercise though, which I needed to do. I hope my legs are still in working order tomorrow morning, I've got to go and run 5k in the Park. If it's raining I won't go, I'm not running in the rain, I'm not that daft, ha ha. Making a storage system for beads. It's a good job I love broccoli ! Not another broccoli recipe ! Lipsmackin broccoli soup. Chuffin lovely.